Room addition plans create additional space in the existing floor plan of your house design, while also providing flexibility. Maybe you love your neighborhood, yard and home's floor plan, but suddenly find yourself needing that additional space you long for. Why not add a room addition? Immediately you’ll expand your square feet of living area and provide yourself with the extra space you need whether it’s for a home office, casual living area, or storage. 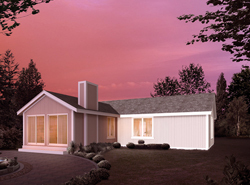 Our collection of room addition plans includes many styles and sizes perfect for expanding your living space in a seamless way without the hassle of moving. We offer detailed blueprints that allow the buyer to visualize the space right down to the smallest detail. With a wide variety of plans, we are sure that you will find the perfect do-it-yourself project to fit your needs and style.